We make the kids karate classes very affordable by charging low fees, by not charging for gradings, and by allowing students the option of wearing a uniform or not. We do not have any contracts to lock in our students. We do not believe in high pressure sales tactics to sell our equipment. 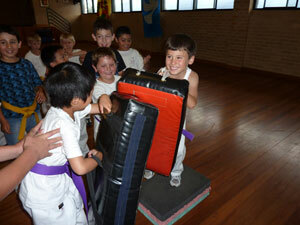 Our total costs are much lower than our competitors, and the best value kids karate classes in Sydney. We make karate fun. We play games to build agility, teamwork, coordination, and concentration. The games keep kids interested. We make it super easy for kids. All moves are broken down into the most basic steps. We specialize in karate for children – we don’t throw them in the adult classes or treat them as “miniature adults”. We focus on self-confidence and self-esteem. Only positive words are used. We divide classes according to age and experience. We put children in classes with other children their own age and level of experience. We teach self defence only. We teach non-aggressive behavior and that violence is not the way to solve our problems. We have the best instructors. They must be black in belts in our system. We have observed them over many years interacting with children. This must be the longest “interview process” in the world.